Posted 19 June 2013 under Ask Us. Is soy bad for you? I read an article that said consuming too much soy can be bad because it contains estrogen. Is this true? Should I cut soy out of my diet? Some people think that soy can be harmful because it has naturally containing compounds (called isoflavones) that are similar to human estrogen, a hormone that’s partly responsible for the difference between males and females. You may have read that the estrogen levels in your body can be altered by eating soy, and could possibly lead to higher risk of breast cancer, but research does not support this. 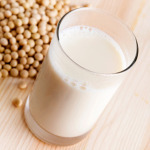 Soy is packed with nutrients such as calcium, potassium, and fiber, and is a high quality vegetarian protein. When used as a replacement for animal proteins (such as beef) in the diet, soy may help lower cholesterol levels (unhealthy fats in the blood) and even keep bones strong! In vegetarian and vegan diets, soy can play an important role in meeting the body’s protein needs. You can enjoy whole soybeans (edamame), or eat soy in the form of tofu, tempeh, soy milk, or soy protein added to many packaged foods (think nutrition bars such as Luna or Clif Bar). All things considered, we wouldn’t recommend that you cut soy out of your diet. As with any food, moderation is key. Instead of avoiding soy, focus on balancing soy foods with plenty of fruits and vegetables, as well as whole grains, low-fat dairy, and quality protein sources including nuts, beans, fish or lean meat.